First off it is good to see these projects get started. I would also like to see a bonus paid for plants that will use energy storage so we can advance that technology too. I hope it works out for the Stirling Dishes. One advantage I believe they will have over conventional power plants is they are able to adjust to the seasonal north-south movement of the sun. The trough style plants are not able to do this and they lose some efficiency because of it. The tower style power plants should be able to do this also. Now first off I am far from an expert on the Stirling Dish but I think it will have some problems competing with conventional solar thermal. First off its efficiency claims are BS. It may do very well for the amount of sun hitting the dish but will require more land than convention solar for the same amount of power, so that claim is just smoke and mirrors. A few years ago they were trying to get a company I worked for to go in with them on projects. This company is well established in solar and other renewable energy. They basically considered the Dishes to be a joke. They felt that they were drastically underestimating the maintenance and manpower needed to run these things. I know they have recently redesigned the dishes to use less parts but I am skeptical on just how well these things will work in the harsh desert climate. It is one thing to operate a few hand built and maintained units. It is quite another to operate 29,000, mass produced units, on ten square miles of desert. 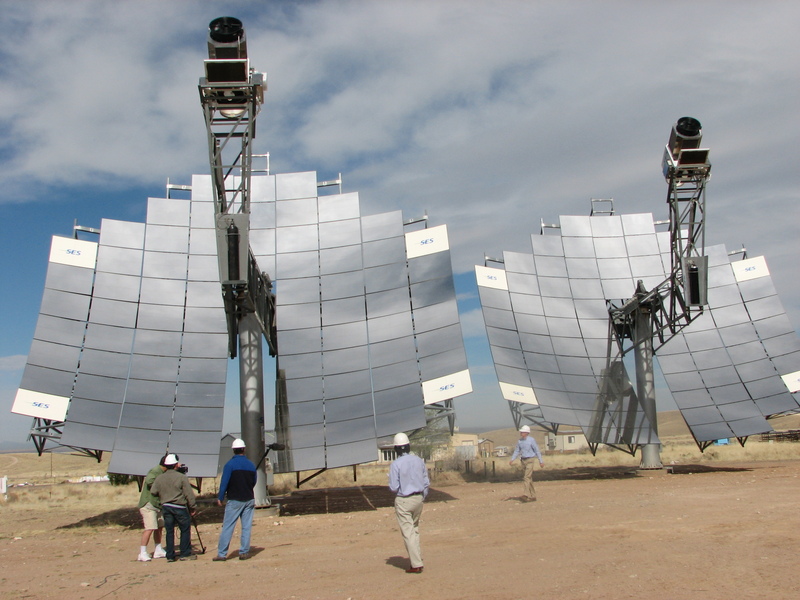 Another claim the dishes use is decreased water use but with most of the conventional solar thermal plants using dry cooling that should be a very small advantage for the dishes. In a steam power plant very little water is actually used to make steam as it is a closed system. Most of the water use will be used to clean the mirrors. This is something that the dishes will have to do too, so there should be very little advantage and honestly I am not really sure how easy it will be to clean the dishes. They look to me like they will be difficult. The trough style systems are fairly smooth and together in one place. They usually get one good hand cleaning a year and then they are easy to wash off with high pressure sprayers on a water truck the rest of the time. Don’t forget to mention thermal energy storage, Todd. The Southern California Public Power Authority embarked on a program earlier this year to install distributed thermal energy storage units throughout its member utility service territories over the next few years. They’ll use these devices to cool buildings during peak hours from ice made at night. The thermal energy storage units can absorb loads from renewables, particularly night time wind. It’s worth noting that the program doesn’t involve subsidies. SCPPA buys the units and installs them on commercial buildings free of charge to the ratepayer.